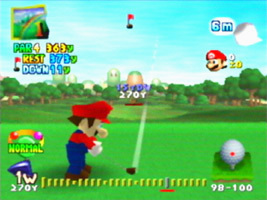 An N64 golf game set in the Mushroom Kingdom and featuring Mario and friends. Select your club and hit the ball across the green and into the hole within Par. 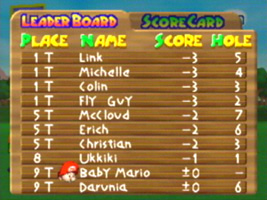 The player with the best score after up to 18 courses wins the tournament. The accuracy of your shot is determined by a power meter at the bottom of the screen. You can view where the ball will land, and alter your shot accordingly. Beware of the wind speed and direction and make sure to avoid water hazards and sand traps. Each character has their own strengths and weaknesses, and you can unlock more as you play. You can also import your custom characters from Mario Golf on Game Boy Color. There are probably even more cameo names available. You seem to get a lot of different names if you play the different courses a few times.